Chances are, your tots aren't spending their summertime hours tracking down the most eco-friendly school supplies and would be inclined to pick up a notebook made from virgin paper (especially if emblazoned with the face of a favorite character) or a crayon set that may contain toxins. 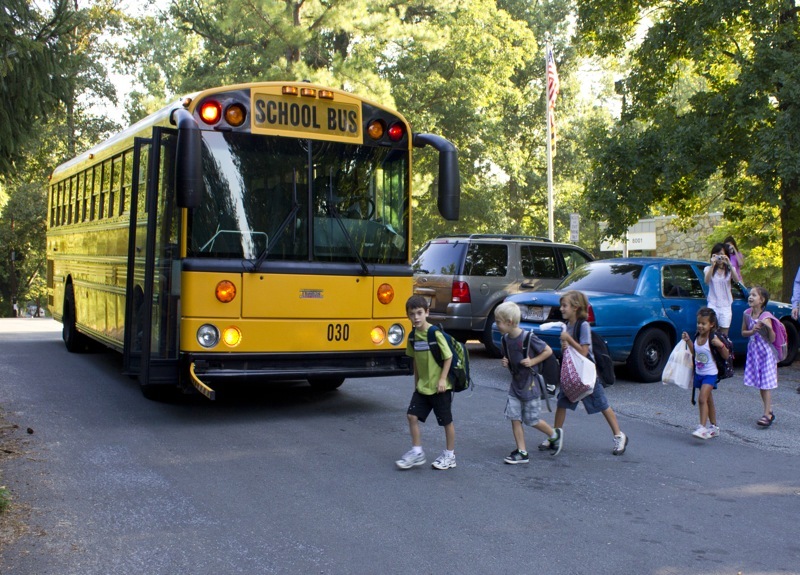 It’s up to you to find the greenest goods out there that are designed catch your kid's eye, so that they are ready to go for an eco-friendly first day. Our must list of school supplies includes notebooks, pencils, crayons, pencils cases, and other back to school basics that look cool and have as much street cred as green cred. Ecojot’s cheery and cheeky notebooks, made using 100% recycled, acid-free and chlorine-free paper, along with vegetable-based inks and glues, definitely fit the bill for appealing notebook options. We’ve covered their special Jane Goodall Collection before, and they also have a journal whose proceeds benefit Canopy, a non-profit environmental organization that works to protect all the world’s forests, species and climate. The kids collection is cute and funny enough to get anyone excited about grammar lessons-think monkeys on skateboards, a scattering of ants, and even cupcakes. Turns out when you buy any of their eco sketchbooks as well as certain journals, the company will donate a school workbook or pencil to a child in need. They’ve already donated 81,000 notebooks across the world-so stock up and help them spread the school supplies love. Another option: a sleek, almost mod looking design by Mr. Ellie Pooh featuring elephants. The notebooks are all 100% recycled and made with 50% post consumer waste. The other 50% comes from fiber from Sri Lankan elephant dung, which could not possibly be more thrilling news for the 6-year-olds we know! 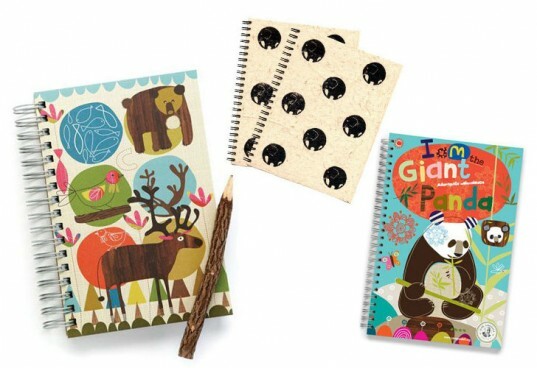 Parents will take heart in knowing that the fair-trade notebooks are helping to provide employment for Sri Lankans as well as reasons for elephants to be seen as an asset to the local community instead of a threat. Pencils made from rolled discarded newspaper that don’t break when dropped and last twice as long as regular pencils? Yes, please! Myobon’s pencils appeal to Mom and Dad’s green sense as well as your child’s sense of style, including various designs such as an artsy rainbow pattern and a set featuring wild animals. Want to give your child a boost in school? Smart Smencils, also made from recycled newspapers, are scented with peppermint, known for stimulating brain power and concentration. Come to think of it, we may keep a few for ourselves for the mornings when coffee or tea isn’t enough to get us going! Smencils also makes a set of colored pencils from recycled newspapers and naturally scented in flavors such as grape, cotton candy, and root beer. Each of the 10 pencils in the pack comes in its own compostable and recyclable corn-based plastic case, which helps keep the color on your child’s paper and not all over the bottom of their backpack. Yesterday’s News uses old Chinese papers as the basis for their hip recycled colored pencils. 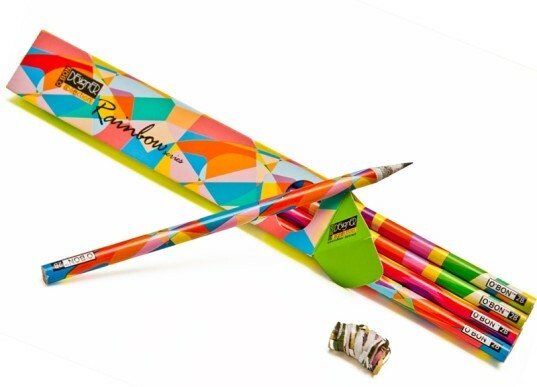 The pencils come in a cute tube which is also made from recycled newspapers, making the whole package green as well as black and white. Of course, kids will be needing a pencil case to hold all of their pencils, erasers, random coins, and any other object that needs safe-keeping. 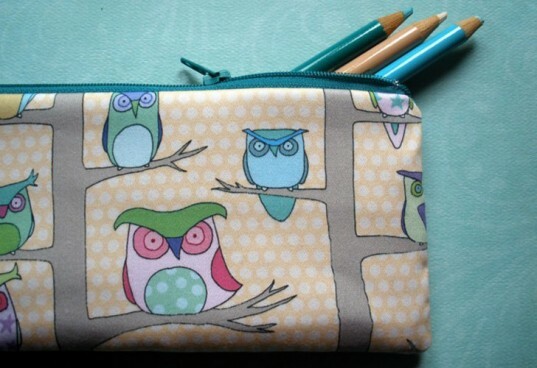 Pocket Carnival’s pencil cases are sweet and playful, covered with frogs, little birds, and woodland creatures. Printed on organic cotton in a studio powered 100% by wind energy, they are the perfect place for your child to keep together all her drawing and writing tools-and to give her some artistic inspiration as well! 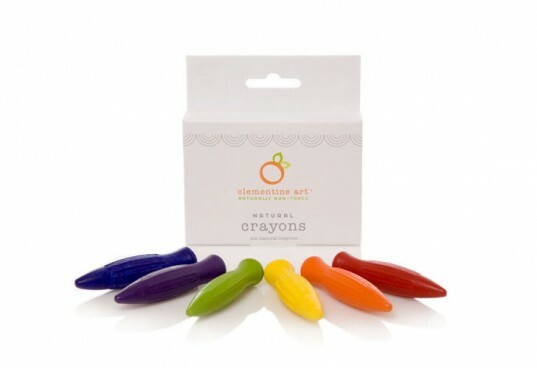 For more traditional shapes, go with Clementine’s soy-based crayons or Prang’s jumbo crayons, which are also soy-based and lead-free. Prang’s crayons, available at Stubby Pencil Studio, are made from 100% renewable energy. The soy base yields a smoother and less flaky crayon, which means your child’s beautiful creations (even if you have no idea what that squiggly yellow line and that green circle really are) will be even more fun to create. Clementine also carries the same soy-based crayon in a rock shape, which may be easier for smaller hands to grab. Finally, P’kolino’s non-toxic, triangular shaped crayons were designed to fit well in your child’s hand and to prevent them from rolling away. 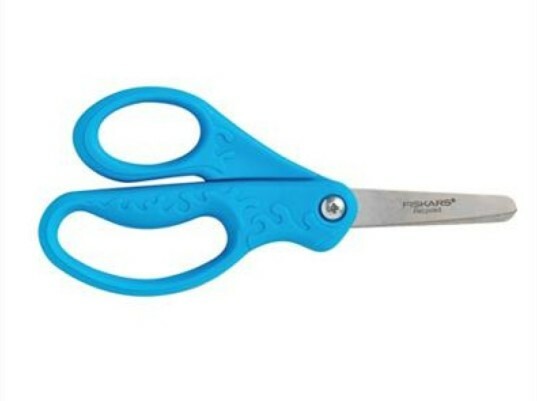 The handles on Fiskar’s kid’s scissors are made from 100% post-consumer recycled plastic (their packaging is recycled too!). Righties and lefties can both use the scissors, which are made from stainless steel and were designed specially to give little hands some extra comfort and control while cutting. The blunt tip gives parents a feeling of comfort as well. 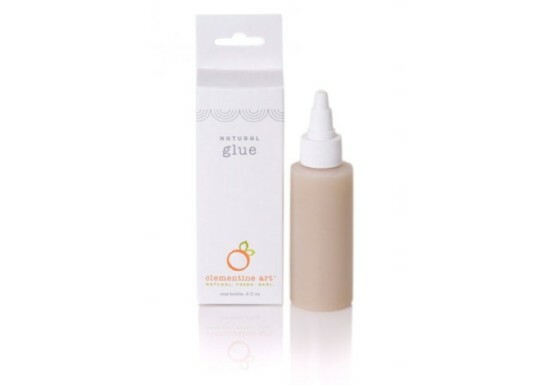 Another great product from Clementine Art is their natural glue, which is made without scary sounding ingredients and is completely reversible with water, making clean-up a breeze. The clear-drying glue works on a variety of surfaces, including fabric and paper. Here is one more eco friendly supply- A TickleMe Plant. I always send my kids to school with kits for the class to grow their own TickleMe Plants. TickleMe Plants are the only interactive plants that kids can tickle and actually watch the leaves close and the branches droop. You can find educatioanal materials, experiments, The TickleMe Plant Book, cool videos and classroom kits to grow your own TickleMe Plant by searching on line. My kids friends still talk about the experience of growing their own TickleMe Plant years later. So send some kits in at the beginning of the school year for a great way to give the kids a hands on experience with nature and gardening. Ecojot’s cheery and cheeky notebooks, made using 100% recycled, acid-free and chlorine-free paper, along with vegetable-based inks and glues, definitely fit the bill for appealing notebook options. We’ve covered their special Jane Goodall Collection before, and they also have a journal whose proceeds benefit Canopy, a non-profit environmental organization that works to protect all the world's forests, species and climate. The kids collection is cute and funny enough to get anyone excited about grammar lessons-think monkeys on skateboards, a scattering of ants, and even cupcakes. Turns out when you buy any of their eco sketchbooks as well as certain journals, the company will donate a school workbook or pencil to a child in need. They’ve already donated 81,000 notebooks across the world-so stock up and help them spread the school supplies love. Want to give your child a boost in school? Smart Smencils, also made from recycled newspapers, are scented with peppermint, known for stimulating brain power and concentration. Come to think of it, we may keep a few for ourselves for the mornings when coffee or tea isn't enough to get us going! Smencils also makes a set of colored pencils from recycled newspapers and naturally scented in flavors such as grape, cotton candy, and root beer. Each of the 10 pencils in the pack comes in its own compostable and recyclable corn-based plastic case, which helps keep the color on your child's paper and not all over the bottom of their backpack. Yesterday's News uses old Chinese papers as the basis for their hip recycled colored pencils. 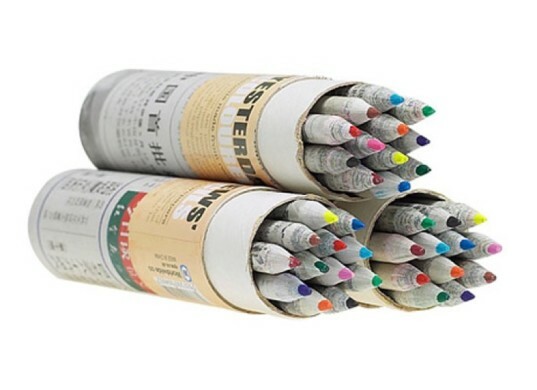 The pencils come in a cute tube which is also made from recycled newspapers, making the whole package green as well as black and white. For more traditional shapes, go with Clementine’s soy-based crayons or Prang’s jumbo crayons, which are also soy-based and lead-free. Prang’s crayons, available at Stubby Pencil Studio, are made from 100% renewable energy. The soy base yields a smoother and less flaky crayon, which means your child's beautiful creations (even if you have no idea what that squiggly yellow line and that green circle really are) will be even more fun to create.